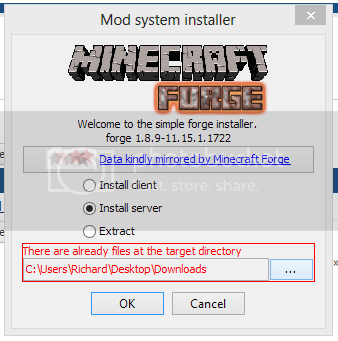 If the Forge version you need is an available option on our list then you do not need to install it manually. Currently we have the Recommended and Latest builds for Forge 1.6.4, 1.7.10, 1.8.9, 1.9.4 and 1.10.2 on our list, and the Recommended builds of Forge 1.11.2 and 1.12. - Log into your mc.beastnode.com account and go to your servers main page (Where the Start/Stop/Restart buttons are found). - Change the drop down list of server options (Will be set to 'Default' if you have never changed this) to the Forge build you wish to install. - Hit the Save button at the bottom of the page. This will install the selected Forge version. Note that when you run one of the Forge options it will completely wipe the contents of the mods folder (to avoid version conflicts etc...) so make sure you have not already installed your mods when you do this! Click OK and let it complete the process and click OK on the pop up that comes up when it is done installing. Start up your server and you should be good to go (your server should automatically generate the "mods" folder if the install was successful). The control panel may not display your server as online via the status icon, so you may have to rely on the console to check for server status. Now you can download your favorite mods and simply upload the zip/jar files for them to the "mods" folder of your server to install them (via FileZilla as above). Make sure to pay attention to the version of Forge ModLoader the mods you want to install are using and make sure you have the correct version of Forge the mod needs. Note that not every mod installs via the above method, so always make sure to read the full directions for the particular mod you are installing. If the mod works properly, your server should start up. Tip: Install mods one at a time (including any dependancies for that mod) so that you can always determine if a single mod is the cause of your server not working. - Enter a new world name in the World box (can be anything, just not the name of a world that has already been created unless you are uploading your own world folder for it to load). - Hit Save at the bottom of the page. - Go to Files > Config Files on your control panel and open the Server Settings. - Change the level-type option to what your mod requires (for Biomes O Plenty for example, change it to BIOMESOP all in capitals). - Save changes to the file. Then start the server back up to load a new world up, generated specifically by the mods you are using (so all natural ores/mods/buildings etc... are spawned correctly). **Note that some mods are clientside-only, or singleplayer-only and cannot be used on the server! Clientside only mods will work fine if they are installed on your launcher but not on the server, and will crash the server if installed on it (examples being HUD mods, most minimap mods or Optifine). Singleplayer only mods simply cannot be used with a server at all. It is rare for a mod to be singleplayer only any more, but this can come up here and there.